Description: Draw the baby curl on the forehead like so, and then use the face guide you made in step one, to draw out the big baby eyes. Draw in the pupils, and then add a smile, and ear detailing. 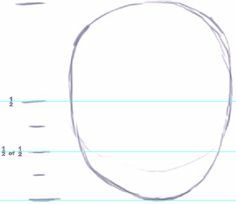 Draw in the pupils, and then add a smile, and ear detailing.